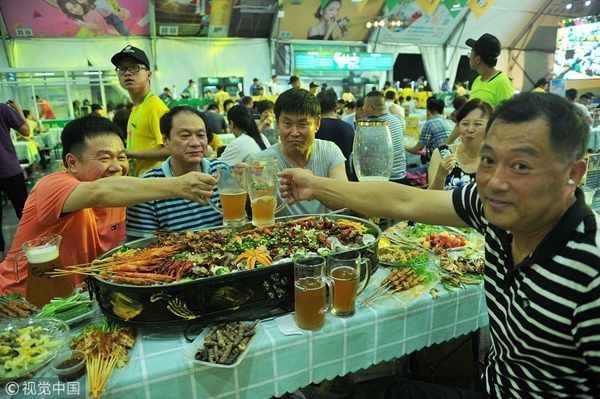 QINGDAO -- The lingering heat and occasional thunderstorms across China this summer have kept many indoors, but not the feverish beer fans who have come to the coastal city of Qingdao for the annual beer festival. The 28th Qingdao International Beer Festival unveiled its curtain late last month and will run until Aug 26. Featuring more than 200 beer brands from over 30 countries and regions, beer enthusiasts can enjoy the refreshing taste of more than 1,300 types of beer at the month-long gala. In 1991, when the first beer festival was held in Qingdao, most of the vendors and sponsors were domestic brands. These days, the festival has grown into one of the biggest in Asia, with this year's venue occupying more than 800,000 square meters. The festival period this year has also been extended to accommodate more tourists as the fame of the city soared after it hosted the 18th Shanghai Cooperation Organization (SCO) summit in June. "This year's beer festival features many SCO countries, with new breweries coming from countries such as Russia and India," said Mi Desheng, director of the Xihai'an (West Coast) New Area tourism commission, where the festival takes place. "I am especially looking forward to trying Old Miller from Russia and Kingfisher from India," said Song Zhihao, a regular visitor to the festival. Boasting pristine beaches and an active expat community, Qingdao is known for its unique blend of different cultures. Tourists are often surprised to find Bavarian architecture and Catholic churches situated beside Chinese hutongs and Taoist temples. The beer festival features the same cultural mosaic as the city in which it is held. Nakemai Wangihomie came to Qingdao two years ago from Papua New Guinea. She said some of her foreign friends travel to Qingdao from other parts of China for the beer festival every year. "Qingdao is a culturally inclusive city. Everyone can find a sense of belonging here," said Gulalek Saparova, a Turkmenistan student enjoying a beer at the Russian beer tent. Qingdao is one of the earliest Chinese cities that has gained access to the global market due to its unique location. As early as 1948, Tsingtao Brewery began serving customers in Singapore. In 1972, its products entered the United States. Now, it is one of the most well-known Chinese beer brands and its beer is available in more than 100 countries and regions. "Opening up has always been the biggest advantage in Qingdao's development," said the city's mayor Meng Fanli. Qingdao is one of the first 14 coastal cities to open up to the world after China adopted the reform and opening-up policy in 1978. In 1984, Qingdao welcomed its first, and the nation's second Sino-foreign joint venture -- Qingdao Huahe International Leasing Company. Over the past three decades, more than 140 global top 500 companies have invested in 271 projects in Qingdao, with a total paid-in investment of over 60 billion U.S. dollars by the end of 2017. In the meantime, Qingdao established trade relations with 215 countries and regions, with its total foreign investment hitting 29.6 billion U.S. dollars as of 2017. After the SCO summit, Qingdao is also expected to receive more visitors this year. "Qingdao will work with cities in the Asia-Pacific region to expand cooperation in various fields such as finance, transportation, and tourism to increase its international influence and quality of urban development," Mayor Meng said while outlining a blueprint for the city's future. Qingdao locals consider the beer made here as the city's best ambassador. Sitting at a table with strangers from across the globe, a toast can easily bring them closer. "Beer lovers can always find something in common," said Sun Xirui, a visitor to the festival. "Qingdao residents love to make friends, and beer is our bridge to start a conversation," said Wang Hongjiang, a local resident.